Many people associate roomy vehicle interiors with SUVs and minivans, but many modern full size pickup trucks offer more room than either of these vehicle styles. Not only do many pickups offer roomy interior comfort, they also offer ample truck bed space and healthy towing capacities. 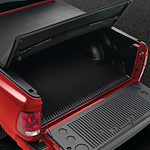 The size of mid and full-size pickup trucks is no barrier to high performance. Since many pickups are made to haul heavy loads, most pickup truck styles offer drivers plenty of extra power under the hood. The extra engine size translates to easy acceleration, higher speeds, and greater hauling capacities.